It's July 1996, right in the middle of that awkward period where everyone is shifting uncomfortably following the TV movie, by this point not yet sure what it means for the future of Doctor Who, but quite sure that the answer is not, at least in the short to medium term, going to be anything good. The now moribund Virgin Books line releases Gary Russell's Third Doctor novel The Scales of Injustice. Gary Russell has something of a reputation for what is generally referred to as "fanwank." That is to say, he's known for writing books that are packed to the gills with continuity references for the sake of continuity references. Now, a sane person could and perhaps even should ask what the difference is between fanwank and, for instance, having the Macra pop up forty years after their last appearance for a cameo. And plenty of people have asked that. If nothing else, then, The Scales of Injustice serves to explore that line. Because this book is not so much continuity heavy as it is capable of producing continuity gravity. Direct references exist not only to the four Pertwee stories preceding it but also to Time Flight, Remembrance of the Daleks, The War Machines, The Invasion, The Web of Fear, The Sea Devils, Warriors of the Deep, and probably a fair swath more that I didn't even notice. One thing you may notice about that list is that not all of the stories are links. That is because many of them are stories that haven't actually aired by the point in the series this novel takes place in. Which means we're in the wild and wonderful world of future continuity, a topic we've picked up in a couple of these Time Can Be Rewritten columns. (Incidentally, a reader found a counter-example to my claim that no stories set pre-The War Games ever mention the Time Lords. Apparently John Lucarotti's novelization of The Massacre does.) But more even than The Dark Path, this is a book about reconciling Doctor Who stories and squaring away continuity errors. It tackles not only the nature of the Brigadier's love life (glimpsed in Planet of Spiders and Battlefield), Mike Yates's assignment to UNIT and promotion to Captain (complete with a gratuitous scene to explain why Benton didn't get the promotion), Liz Shaw's departure (more later), but also, for the horde of people who were concerned about it, the question of why the Doctor claimed to have twice negotiated with the Silurians for peace in Warriors of the Deep when in fact he only did so once. Let's pause here for a moment and look at that. I don't want to get too far into Warriors of the Deep some thirteen seasons too early, but accounting for this supposed continuity error is trivial. First, a bit of context for anyone who is actually trying to use this blog to learn about early Doctor Who. Warriors of the Deep is a 1984 story in which the Fifth Doctor faces both the Silurians and the Sea Devils, the latter being cousins of the Silurians introduced in season nine. It's fairly obvious that writer Johnny Byrne was intending the line to refer to the events of The Silurians and The Sea Devils. The mistake is not in the number, but in treating the Sea Devils as being the same race as The Silurians. I'm not going to say that fanwank is a bad thing. Far from it, I enjoy a meticulous bit of continuity wrangling as much as the next mildly antisocial anorak. But there's something necessarily odd about these attempts to stitch continuity together. The results by necessity do not quite fit with the the stories they're assembling, reading as a strange awkward midpoint between being a story about the familiar characters from Doctor Who and an intellectual exercise. In this case, Department C19, a concept invented in Timeflight, is revealed as a secretive organization that controls UNIT's funding, setting off a somewhat messy bit of conspiracy wrangling involving "The Glasshouse," a mental institution basically for people who snapped seeing top secret alien stuff, and "The Vault," a massive collection of alien memorabilia salvaged from the various Earth-based stories. These are cool ideas, undoubtedly, but it's tough to see how they fit in around the UNIT era as we've seen it thus far. It's not that it contradicts anything. It doesn't quite (although the book does contain a massive retcon to The Silurians in which the Doctor's accusation of murder turns out to be totally false). But equally important, it doesn't quite fit either. It doesn't mess anything up, but it doesn't exactly clarify it either. But the real problem with reading the novel in 2011 should be obvious from the description of C19 and the Vault, namely that it's inconceivable that such a novel would be written today without a friendly visit from Torchwood. Ah, yes, Torchwood. The hot new pet game for Pertwee-era watchers - how the hell does any of this reconcile with Torchwood. God forbid anyone take up the obvious answer - it doesn't, and no serious effort to make it reconcile has ever or will ever be made. But that's not the point. Torchwood is no harder to work into the Pertwee era than Department C19 or Remembrance of the Daleks are, and the book does that. So why doesn't it deal with Torchwood? The obvious retort - that Torchwood didn't exist in 1996 - holds historical water, certainly, but given that the book is already imposing ideas that didn't apply to 1970, something about this defense fails to quite hold. Once the door is opened to this sort of ludicrous retconning, it's tough to draw the line. Especially because the book as it stands feels... obsolete. Certainly it's nearly impossible to imagine that Russell would approach it the same way today as he did in 1996. Which is something that the fanwank genre, love it as I do, can never quite account for. All attempts to cobble together pet theories out of existing evidence are as much a product of their own eras as the "errors" that they attempt to correct. The idea of seamlessly fitting a big continuity fix into the era whose errors were never realized at the time (and often couldn't be realized at the time) is inherently off. All of which said, we should look at the gaps this story attempts to fill - or at least, the gaps that existed in 1970/71. The big three are the introduction of Mike Yates, the departure of Liz, and the question of the Brigadier's personal life. The first of these is easy - Yates appears settled in by Terror of the Autons, despite that being his debut. This story (and apparently Christopher Bulis's The Eye of the Giant, though I've not read it) deal with Yates as a Sergeant and attempt to justify his promotion to Captain. It's unobjectionable. The second borders on the welcome. The fact that Liz was abruptly written out between seasons without significant explanation is really comparable only to the writing out of Dodo, Ben, and Polly in its sheer callousness. Much like having a major character commit genocide with no consequences, dropping a major character abruptly and without expectations does damage to the show, making it harder to invest in new characters. When characters are treated as disposable by the show itself, why should we invest in them? But this gets to something about the era. As we saw with Inferno, the show is getting to a point where it's a character drama. It's starting to rely on audience investment in characters as part of what makes the show work. (Which is why crap like Liz's non-sendoff is so grating.) With Jo, the Master, and Yates coming in in the next story, we have a fixed recurring cast that's going to stick around for three seasons in its entirety, and, for many of the characters, for four seasons. (This also suggests that Letts was very much aware of the problems caused by writing Liz out the way they do.) And even if Russell overshoots the mark with the Brigadier, there is a sense in which this dimension of the book is a case of making the UNIT era - both up to this point and beyond - live up to what it tries to be better than the show does. In the end, of course, it's all a bit of a mess. The depth of retcons and the degree to which they jar with the actual era on television muddy the waters to the point where it feels like you're reading about Doctor Who impersonators rather than the characters. It feels, in effect, like fanfiction instead of like Doctor Who. But on the other hand, there's something intriguing here. It may be fanfiction, but it's got some interesting ideas. It doesn't fit seamlessly into its gap, but no Time Can Be Rewritten story has fit seamlessly into its gap. The dissonance is the point - the reason to revisit the past. This is 1970 avec 1996. Now that it too is a historical object, it has become, in an odd way, more interesting for it. In a topic as vast as Doctor Who, the opportunity to see vividly a 1996 take on what Doctor Who is in 1970 is an oddly compelling signpost in the show's evolution. That nobody but a die-hard fan would care seems beside the point. After all, it's not like The Scales of Injustice wasn't assuming an obsessive reader back in 1996. Couple of things. Firstly, fanwank - as coined by Craig Hinton, and used within Doctor Who fandom simply refers to gratuitous use of continuity, rather than to a retcon. Secondly, the continuity problem with Warriors of the Deep wasn't that it referred to The Sea Devils like it featured the Silurians. It was that it referred to both stories featuring the Earth Reptiles "offering the hand of friendship" to the humans. And it's nearly impossible to imagine how they could be reinterpreting the events of The Sea Devils in such a way. 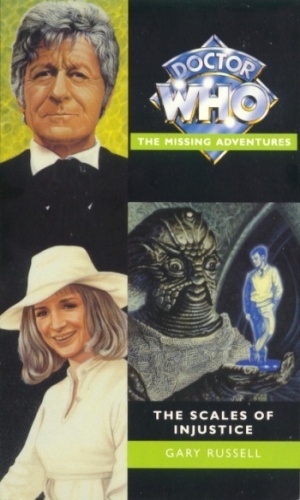 This idea of how to approach continuity in "missing adventures" raises an interesting dilemma: do you studiously avoid any references to things that "haven't happened yet" (e.g., no mention of Time Lords in stories set before "The War Games"), or do you pack in everything we know "up to now" and run the risk that something like the creation of Torchwood will render all your careful retcons outdated themselves? The former seems the only sensible way to "future-proof" the story: if it must be trapped in time from the moment it is published, then anchoring it as close as possible to the time when the adventure would theoretically have aired at least gives you some control over the process. Better for "The Scales of Injustice" to feel stranded in 1970, as was the intention, than in 1996, which surely wasn't. Stephen - Ah. I haven't seen Warriors in an age, so that explains it. That said, I don't think there's such a thing as heavy use of continuity that isn't in some sense a retcon given that most of the continuity was never meant to be connected. Well, I guess that's a valid take on whether something's a retcon or not (though one that ceases to apply once you reach the JNT era or later). I'm not convinced that it's one that's very useful for analysis, though. Of course, some of the best examples of fanwank in Doctor Who are where the story builds something new out of the continuity references. My favourite examples being the novels Alien Bodies (which basically creates the EDA mythos) and - controversially - The Quantum Archangel (which takes everything plus the kitchen sink in the quest to build the most epic Doctor Who story ever and - as far as I'm concerned succeeds). Where it fails is where there's nothing new created (or where it's done in a mean-spirited way). Although sometimes a fanwank story can be fun without doing anything particularly new (see Craig Hinton's less ambitious Doctor Who novels). Also, bets are on for the other Pertwee novels/audios you'll cover. Rags and Verdigris seem pretty safe bets as deconstructions of the era, Last of the Gaderene is a possibility as the ultimate distillation of the UNIT formula, Face of the Enemy is an outside chance for what it does with the Master, and then there's The Paradise of Death and The Ghosts of N-Space - showing Letts, Pertwee, and Sladen do a 1990s take on the 1970s. I wasn't contemplating Rags that seriously, and if I recall it's set around where I'm watching now, so its ship has sailed for the blog, though I always need a few extras for the book. I'm still crossing my fingers that the last one is the Dust segments of Interference, though I'm pretty sure that's unlikely. You can't discuss this stuff without mentioning the almosdt universally loathed War of the Daleks. It's not the best book in the world; but I can't help admiring the bald-faced way in which he attempted to re-write Dalek continuity. I see no problem with the book being stranded in 1996's 1970, either: it is rather a fun thing, and unavoidable, given that it can't really be set in 1970, no matter how hard the author tries: that boat has sailed. I was just wondering if Gary Russell, or whichever Missing Adventures author we pick, felt the same way? Clearly the point of these things on some level is a neatening, tidying impulse, where something the Fifth Doctor says needs to be somehow shoehorned into the continuity of a season of the show that began broadcasting when Peter Davison was nineteen! Knowing that all your squaring of the corners is doomed to be undone as the show progresses renders the whole thing oddly pointless, unless your aim is to create a time capsule of how mid-90s fans saw the 1970 series, which is a very odd thing to do. We can still enjoy it in that way, of course, and it is probably more enjoyable like that: we have the benefit of a double layer of nostalgia/interpretation: we can enjoy looking back simultaneously to 1970 and 1996. My suggestion of avoiding timey-wimeyness was more for the sake of the authors. If I ever sat down and did a Missing Adventure myself, it would include no continuity beyond that featured in the three Frederick Muller books from the 1960s, which would simplify matters considerably . . . I've just finished reading this book and I think the more pressing problems with it revolve around its lack of a story. A lot of characters seem to be running around and threatening each other but I'm not convinced anything was resolved or that anything really happened beyond Liz deciding to leave at the end. There's this place called the Glasshouse which is very murky. But then there's the dodgy side of C19 sodding about as well. All the villains escape - the pale young man, the Auton twins, Auggi the Silurian - whilst some get a big build up early on and then just disappear from the action entirely with a reference later on as to where they've gone - the assassin and the hound. The plot seems to involve the dodgy C19 agents trying to get their hand on a Silurian but not really going about it in a particularly competent way whilst their main agent finds people to threaten and to whom he can explain their modus operandi. Meanwhile there are some Silurians hanging about that sit around in a cave before an arbitrary attack on the beach. Then suddenly lots of people invade C19 HQ (or whatever is was) and, um, the baddies escape. And the Doctor spends the story doing nothing at all. Books that exist to pull together continuity but without giving a story in themselves I find to be very queer beasts. I've never read Who Killed Kennedy so I'm sure lots of references passed me by but this book is difficult to follow anyway without the feeling that all of the interesting stuff has been smuggled away to be fed into a sequel novel (Business Unusual, in a different range of books, presumably in part for a brand new readership). It's a love letter to season 7 in many ways but without a story or even a basic plot to hinge everything on. Oh, and the Doctor negotiates for peace with the Silurians, yes, but they don't "offer the hand of friendship" at all. It's briefly considered and then abandoned when they suddenly realise two people have wandered onto the island. In fact, it's more difficult to square this as being referred to in Warriors than it is imagine Icthar was talking about The Sea Devils (the author's original intention). In there the Chief Sea Devil actually agrees to peace with the Doctor before the base is actually attacked by depth charges, whereas in Scales they just consider it for a bit and then decide not to out of paranoia before any sort of attack has been made on them. I'm not really concerned by any of this, I just find it strange that Gary wanted to plug what he saw as a continuity blunder (which nobody else was ever worried about) and then makes a hash job of it. The thing you find unobjectionable, oddly, is the one which broke my WSOD for this book. Russell's promotion of a Sergeant to a Captain suggests he does not understand the Army's structure of commissioned and non-commissioned officers; it is almost vanishingly rare for an NCO to receive a commission, and they'd probably become a lieutenant. The series got this right when Benton eventually became a Warrant Officer, though even that's a pretty big jump straight from Sergeant. This would have been better handled by inserting Yates as a captain and showing him earning Benton's trust, I think. UNIT's UK clearly isn't our UK, but it's meant to be similar in most ways not actually involving aliens, and this feels less like deliberately using a different structure than just not knowing what the structure is supposed to be. I'm not military, incidentally; the NCO/commissioned officer divide is not obscure knowledge. You need Weighing Scale orWeighing scale for weight measuring in home as well as in the gym. Many companies offer you different kind of Electronic Weighing Scale with attached plans. They make many promising quotes relates to these machines but you need to be ware. Your blog really contain lots of useful information. We have to read all the condition before making decision to take these packages of Weight Machine.